An interesting topic that seems to be cropping up more and more in recent science fiction novels involves the concept of the "post-human" - either through genetic manipulation or technological augmentation. It's quite the interesting thought puzzle that requires one to better define what it means to be human and thus also determine when someone stops being human. 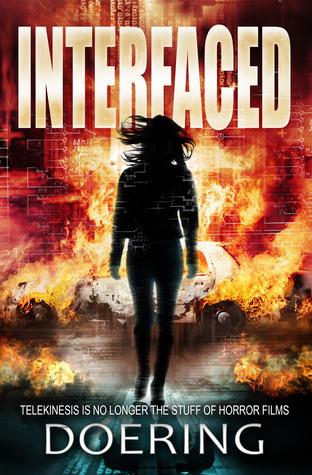 Interfaced is one such post-human story presented as a bit of a mystery thriller. And the build-up for this particular story was rather interesting since it was presented in a highly personal fashion. A few years back we might have argued that this could be slated more as a "cyberpunk" story, only because of the angle of integrating technology into a human. But that genre had a totally different feel and the more widely-used term now seems to be "post-human" more than any other. This is neither here nor there - they're all interesting stories that try to figure out the future of humanity. And that's where science fiction ultimately shines - when it tries to project our future and speculate how life might change. Synopsis: Interfaced is a techno thriller novel by Emerson Doering. The ebook retails for about $2.99 on Amazon at the time of this review. Disclosure: I was provided a free copy of this ebook in exchange for my honest opinion of the work. The story centers around Kristen Crede, a triple-amputee who is getting a new chance for a more "normal" life with the help of Doctor Jackson Prophet. Prophet's research is connected with developing prosthetic limbs that can be controlled wirelessly using direct thought input from the brain. And given how miserable Kristen's life has become since the accident that took both of her legs and one of her arms, she's somewhat invested in this experiment working out well. But around the same time, a man in steel-toed boots shows up and starts taunting Kristen about a role she is going to play in some other tasks. And the man is blackmailing her with photos revealing something rather disturbing - images that seem almost impossible to Kristen. And when the man, Dylan, turns out to be someone her mother is dating, things get all the more complicated. Dylan's plan involves Kristen as a pawn of sorts, with a significant focus on her upcoming operation. The novel starts off with some pretty steady (and potentially slow for some) build-up as we meet Kristen and Jackson. And this is more than just a quick introduction with basic Jeopardy facts about them and then straight to the action. We actually get into the heads a bit more and sort of get caught up on what has been going on in their lives as of late. I felt this was particularly powerful for Kristen since we get a deeper look into her emotional state. And while I don't have firsthand knowledge of what it's like to lose a limb, I found the way that Doering wrote Kristen and expressed her pain was pretty vivid. More than just talking about phantom limb sensations (which is rather typical), we went a little deeper into discussing the different aches, pains and of course complications with just getting by. And when you only have an arm left to you, one's options become highly limited indeed. The story is mapped out across 6 days, which was an interesting way to segment things but not necessarily all that essential. It gave us a marker for how things were progressing, but I didn't see additional meaning in the timeline itself. The overall plot involving this ex-con Dylan and his plans to use Kristen to get what he wants wasn't all that compelling. It wasn't immediately clear to me what he hoped to do nor was it all that feasible that he was the key mover here. His accomplice, Natasha, felt a lot more like a background character (not even a supporting one) for most of the book and she could have had a bit more time in the spotlight. But what interesting was how Kristen was able to explore her new "abilities" as enabled by the device implanted into her head. We take certain liberties with just how quickly she acclimates to this new technology - there's a particular scene that goes out of the way to demonstrate just how innately gifted she is for it - in the end she gets to be pretty kickass. And one can always argue about the amazing potential of the human brain to do any number of things. And Kristen really goes all out in a blatant Carrie homage that worked out rather well. Towards the end I was worried that the story was going on a little too long and the whole risk of not knowing how to end things, but the big finale complete with a few more reveals actually worked out. Get past the hump of the first two "days" of the narrative and the rest of it is pretty interesting. Interfaced is really more about presenting a particular post-human scenario as opposed to trying to get all philosophical about the nature of humanity and all that jazz. And this focus works well with the direction of the book and leads to a good little thriller with a future technology as a plot device and not necessarily a key plot point in itself. The book gets 4 surprise applications of Kristen's implants out of a possible 5.